Despite the fact that I’ve been teaching public policy since 2006 (yes, a decade already!) I have always loved varying the content and outline of my courses. Primarily, I am interested in teaching my students employable skills, I aim to teach them how to write policy content that can be read by policy makers, and I work hard at innovating with the content of my courses. That’s one of the reasons why I almost never, or practically never, teach with a textbook. I have tried many, I have tested many, and I’m always torn because none actually does exactly what I want them to do. There are many excellent textbooks for specific courses that I no longer teach. For example, Michael Howlett and M. Ramesh’s extraordinary book (whose 2009 edition includes Anthony Perl as another author) on studying public policy is excellent for the actual public policy cycle literature. But this semester, I am teaching policy analysis, and while I love many of the traditional textbooks, including Weimer and Vining’s classic, I wanted something MUCH more applied, and with a focus on actual skill-building. I have to admit that I did not expect Michael Mintrom’s Contemporary Policy Analysis to be as good as it is. I figured that it would be hard to beat Weimer and Vining, despite the extreme focus on cost-benefit analysis that these authors have put into their book. Well, I have to say that Mintrom has not only assuaged my concerns, but has surpassed my expectations. Contemporary Policy Analysis, published by Oxford University Press, is an extremely readable, agile, accessible and useful book for policy analysis students who want to be actual policy analysts. Divided in 17 fast, easy-to-read chapters, Mintrom’s Contemporary Policy Analysis presents not only a model for how to do policy analysis (yes, in many ways, better than Bardach’s 8 Steps). There are many things I love about Mintrom’s Contemporary Policy Analysis book. It’s a book for students, a definite textbook, but it can also be used by practitioners, or to teach in a continuing education class. Moreover, Mintrom perfectly executes a story-telling approach to writing about policy analysis. At the beginning of each chapter, Mintrom recapitulates on what has been covered and the chapter’s objectives. He then covers the material in an agile, fast, easy-to-read manner. He finishes with some review questions, exercises and proposals for in-class work or homework. 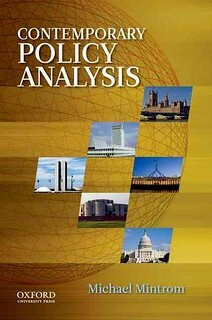 The first 7 chapters are focused on what policy analysts and governments do. Then from chapter 9 to 16, Mintrom covers different analytical strategies (chapter 8 covers which topics and analytical strategies will be used throughout the course of the book). And chapter 17 looks at the professionalization of policy analysis. You can read a chapter-by-chapter listing of book contents here. Overall, I don’t regret having taken the step of assigning a textbook for the very first time in my career. While I am supplementing with journal articles, having a textbook allows me to follow a specific thread in a workshop-manner. So, for this semester, I have chosen to teach my students how to do policy analysis by using Mintrom, while I use journal articles to teach them the theory behind each approach to policy analysis. Mintrom is the main textbook for my policy analysis workshop, and it provides a lens through which my students learn the techniques and tools of the trade. Overall, Mintrom’s Contemporary Policy Analysis is a book I will be recommending to other scholars of public policy analysis. Very easy to read, to implement, and to apply in practice. Tagged with policy analysis, teaching.